Finally, after the summer from hell, Francesca was ready, we were ready, the hurricane god took a coffee break, and we started down the Intra Coastal Waterway (ICW or ditch) from North Myrtle Beach on Monday, Oct. 18. Joan has stocked the boat such that we don't have to emerge for a very long time, e.g. 200 rolls of paper towel, 200 rolls of TP, a 5 cu ft freezer full, refrig full, V-berth loaded with boxed and bagged food, and several hundred pounds of canned food in the aft pantry. Poor Francesca is riding a little low in the water. After only about 45 miles, the starboard engine fuel pump developed a crack and a tiny fuel leak. We had to anchor early in the day to affect repairs and clean up the spill in the engine room. We were prepared with a spare fuel pump, purple stuff and, of course, lots of paper towels. It is normal to expect minor failures early in a trip, especially after laying up for a few months. At the end of the second day, we stayed at the Charleston City Marina and had a nice visit with Andrea and Ray (daughter and son-in-law). The third day, we were making good time until, in mid afternoon, a nasty group of squalls crossed our path and the visibility went below that which we felt safe to continue. After ducking into the next available spot that resembled a secure anchorage, we spent the night buffeted by wind and occasional rain. Thursday, Oct. 21, the sun was shining, the wind was calm and it was generally beautiful in the waterway. 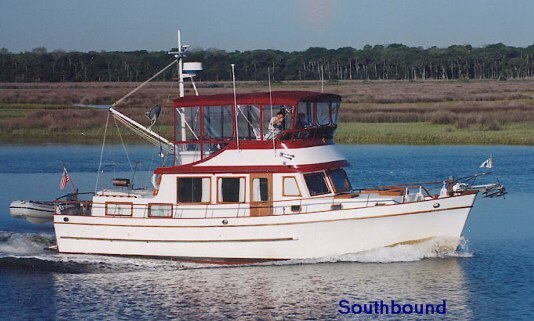 Passing Hilton Head, SC and Savannah, we met up with “Tropic Explorer” a custom steel schooner out of Ft. Meyers, Fl. Buz and Jennifer were gracious and invited us to see their boat. They had done a great job building a go-anywhere type boat. During the next several days, we would keep in touch by radio giving each other advisories about weather, obstacles, shoaled areas, etc. Coincidentally, a few years ago, “Heide” on a cruise north during a very bad (40-50 kt winds) stormy night, had dragged anchor and during subsequent maneuvers accidentally cut “Tropic Explorers” anchor line. Everyone managed to pull this one out of the fire without further damage and later the losses were settled very amicably. It's a small world. Saturday, Francesca was down to ½ tank of fuel. We usually stop at the Florida Petroleum fuel dock in Fernandino Beach, Fl (inexpensive fuel) to top off. Fully aware that the current at the dock can be fierce, and that the wind would put us heavily against the dock, this captain with great confidence decided it would be a piece of cake. We put out every fender available. The dock is fixed (not floating) and it is difficult to keep the boat fended off of the pilings. Well, Francesca and the dock had some kind of disagreement. We were able to get fuel, but the dock was a clear winner after scuffing up our rub rails. Next time, I'll skip the cheap fuel and go where it is less likely that I will smear our dear boat's makeup. Before starting out this time, I had a good talk with myself and decided that I would do my best not to be yelled at, nor yell at anyone. You have to understand that with the variety of watercraft capabilities and wide ranging levels of operator experience / sanity there are frequent cases where boaters (me?) are characterized as unsafe at any speed. Well, somewhere south of Cape Canaveral, a yeahoo sport fishing boat repeatedly passed cruisers close in while throwing a very large and potentially damaging wake. All of the boats concerned, warned, pleaded, YELLED and hooted at this guy. Me too. Well, one out of two isn't too bad. Actually, with the exception of that guy, all of the boaters have been great. We were doing our best to adjust each days end point so as to avoid Daytona Beach and a usually bad anchorage. In so doing, during the next two days, we found the two worst anchoring spots on the east coast. Poor holding (anchor easily pulls free), a long fetch (open water to windward where waves can build) were the only notable features of our anchorage choices. Both nights were windy, but we rode them out fine without dragging. But we did avoid Daytona Beach. Arriving at our first layover spot south of Ft. Lauderdale on Wednesday the 27th, Francesca checked into the Waterways Marina. It is very nice with small shops (Joan loves it), grassy paths (Maggie loves it) and several restaurants. Plans are to stay for 4 days, visit some boat equipment suppliers and the MEGA boat show. The Heides and Harrells (“Knot too Shabby” also from Ft. Meyers) are driving over separately to do the same and will arrive on Friday. The weather is grrrreat. At this point, we're only two days away from Boot Key Harbor. The trip has been as uneventful as usual, but always (even with the dumb stuff) enjoyable. The real trip will begin in a few weeks. In the mean time, we will gain new and renew acquaintances, do a little more boat preparation, and hang out in the Keys. The next update will be in about a week.